Since the United Soccer League’s inception in 1986, Eastern Massachusetts has long struggled to keep its teams in the division from moving or folding all together after a few seasons each, save for the Cape Cod Crusaders who lasted from 1994 to 2008. 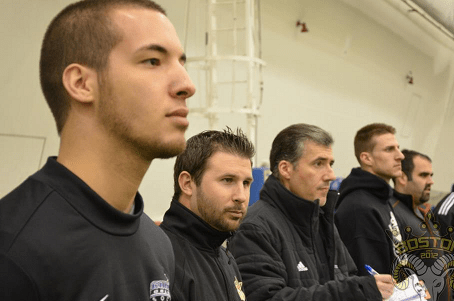 Whether it be the Bulldogs, Storm, or most recently, the Boston Victory SC, success in and around the Hub has been hard to come by for USL squads. Even a team like the Crusaders, once one of the strongest PDL sides in the country, were eventually moved and re-branded (now GPS Portland Phoenix). But with the 2013 Premier Development League season only two months away, a new franchise is gearing up east of I-495: the Reál Boston Rams. Madden, along with a dozen other coaches and staffers clad in Rams coats and clipboards, oversaw the team’s open tryout and the players it brought in at the Dana Farber Fieldhouse in Foxborough earlier this month. The event attracted 150 applicants according to the team’s Facebook event page, even after being delayed in February due to inclement weather. An integral graphic designer and social media manager, Fonseca had a hand in deciding the club’s name and logo along with Madden and General Manager John Barata during the team’s formation. Already announcing player commitments such as the addition of College of Saint Rose defender Paxton Ballard, the inspired Rams take the field on May 11th when they face CFC Azul for their inaugural match.